My back garden today. 29th April. 2010. A few years ago I built the raised bed from recycled brick sections. I planted it with mostly aubrieta and heathers. There are more photos of my back garden in my new blog... Gromit's Ground Force Team. This is so beautiful! I look out at my dry dirt patch and weep! Your garden is simply gorgeous TT. Its gorgeous Terra, I`d love to see more but how do I find your new blog? Hi Sandra and Perry... Thanks. If you click on my avatar pic, that will take you to my home page. Then click on the heading "Blog" and you'll see titles of my recent blogs. Wow!! Nothing else to say. Looks a lovely secluded area, TT, really beautiful, well done on all your hard work. Thanks. The Pieris Forest Flame on the left, is a bit of a colour clash, but I inherited it from my mother's garden, so I allow it to grow next to the mauves and purples ! Lol. Beautiful TT, going to look at your blog. wow, that's beautiful! Love all the colors! Nice pic, recycling and lots of colour to boot....what more can a woman do? Oh, a cuppa would be nice LOL! Simply beautiful ... what a gorgeous sight! I love the way all the vivid colors are set against the background of the serene, restful green. Simply beautiful! Aubretia are so rewarding Terra. You have a wonderful way with them too. What a good idea for a gardener with a bad back, or in a wheel chair. The little touches of yellow, as a complementary colour, set them off well. If I fuss over mine a bit they will bloom again, but they are used as edging, not so creatively as your use of Aubretia. Thanks for your kind words about my gardens ..
Its brilliant TT, what fantastic colours. Hi Terra, well, I always start off with a plan in the begining.......then that heads west, and I make it up as I go along hahaha! I seem to be an ' Intuiative' gardener, the garden tells me what it wants, so I try and go with it. really lovely TT. I love aubretia. you seem to have loads in your front and back garden. ... just above Clarice's comment..Lol. WOW!! Amazing! I love it! Totally agree with everything above; don't think we can lavish enough praise on your garden, your photo and your talent. When I looked at the picture, I thought I'd stepped off into a child's fairy tale book! Lovely. The hardest part of making this was for me to lift the brick block sections... they were heavy ! There is another pic. of this from a slightly different angle on my latest blog. This is stunning..a credit to you ! This looks beautiful! It was worth all the hard work with those bricks!! Thank you. The brick sections are extremely heavy... ! I can only dream of my garden looking anywhere close to this colourful. Thank you Terratoonie. GOY is most certainly helping. I think I am now just as addicted to this place as I am the garden. ... just enjoy ! Lol. Beautiful Terra. Haven't had a chance to look at GoY for a while but so glad I saw this particular picture. Oh Wow....Tt......this is just fabulous! 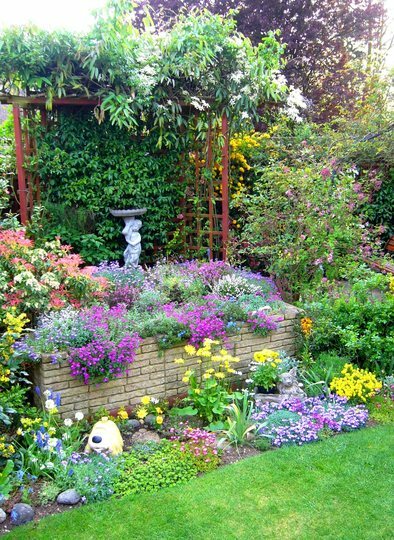 What a beautiful garden you have...well done!! raised bed, pergola etc... I added to the design a bit at a time.. I've had a few Aub's in my time, unfortunately the varieties I have bought have had a short flowering span and usually starting in Spring till about June maybe pushing July, how long does this patch of your garden bloom? I love this kind of look in the garden. Very beautiful. Perfect combination of different colors and varieties. Thank you... the aubrieta usually lasts till June and then other flowers are in bloom, such as campanula and lavender. Simply lovely! Shows what one can do to create a place of beauty even if you have only limited smace! just fabulous,how many years to achieve? Wow that's gorgeous - great job! your garden is very sweet and cute. what do you do with alpines that have died off in the centre? i have a few like that. The ones on the raised bed, or those in front ? i dont think you have any TT ~ but i have several at the edge of my flowerbed ~ which is raised at that point ~ nearly 2 feet from ground level by a stone wall. they were ok last year but this is their second year and they have died back. ok, thank you for that. wasnt sure what to do and it does spoil the look ~ i wanted a nice bright show of colour like you have. Good luck Sticki and Lorraine with your gardening ! Thanks TT - some bits are getting better! You both joined GoY around the same time ! Thanks Tantita, Mitch and Cris ..